Here is another installment of a sample routine or schedule. Know that these samples take into account “optimal” meal times and nap times according to common wisdom, but of course, every family is different. This will work especially well if you’re interested in sleep training any time soon. My surprise caboose baby is nearly 4 months old. Every time I look at him I cannot help but smile and rush over for cuddles. This is good because – as we know – cuddling is good for babies’ brains. He is yummy and smiley and sweet and squishy and it’s just All Too Much. Don’t guilt yourself. Don’t be hard on yourself. Know that you are normal, you are not alone, you are not crazy, and you are a good mom. It takes time to adjust to changes. It takes willpower to remain calm when you’re so tired you want to faint for relief. Of course, no two babies are alike and you will do whatever schedule works for your own home and the needs of your family. That said, this is a typical schedule I’ve used with all 5 of my kids at this age. Yes, I have 5 kids and they are all close together in age. 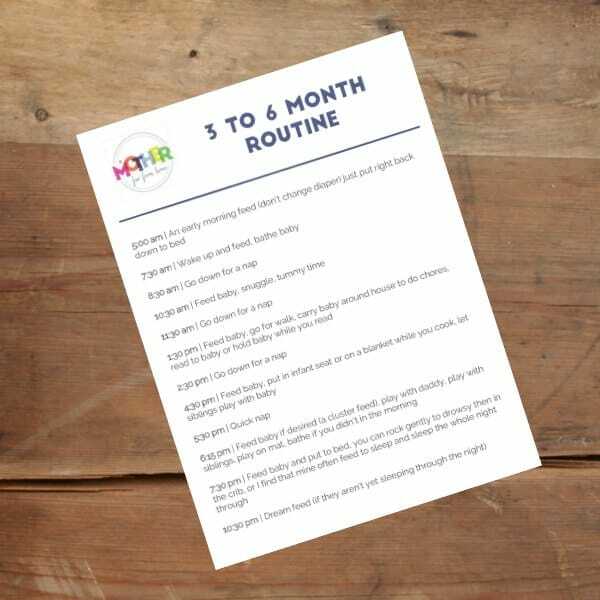 If you’d like to get a copy of the 3 to 6 month routine here, sign up below and get it by email. Here are some basic tips for babies at this age. How to get your baby to sleep later. Try this tip so you aren’t up at the crack of dawn. Feeding babies until one year of age. When do you give solids? How to avoid getting your baby overtired. Overtiredness means they fight naps. How to get good naps with loud older siblings. Sometimes you have to protect the nap. 11 tips to get baby to sleep well for the long run. These include how to change diaper best at night. 28 things to try if baby won’t sleep. Honestly, they work. This may be so simple it goes without saying… but the key to a good routine is keeping the routine. It can be difficult to remember everything when you’re just starting out, but once you get the hang of it, routine will be second nature. Here are some ways you can learn to keep your routine. 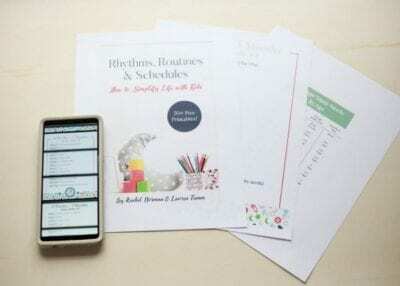 In my Rhythms, Routines, and Schedules ebook (see more below) I have 25+ sample routine printables from babies age 6 weeks to 5 years. 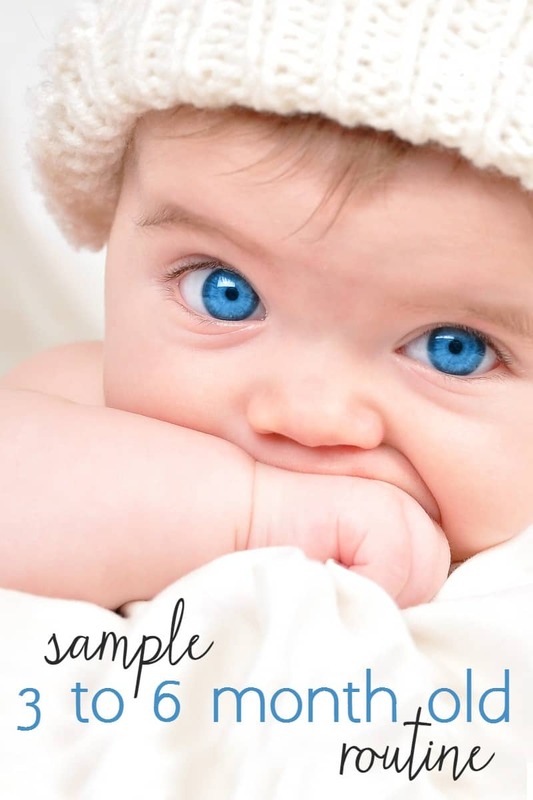 You can take these printables and hang them in your nursery, on the fridge, or keep them in your planner. Whatever works. While you don’t need to live and die by the clock, setting your phone, watch, or a timer will help you keep aware of routine transitions. We can often get so wrapped up in what we’re doing we forget we’ve let the baby sleep 4 hours. Why is that bad? Because 4 hours is a stretch littles ones should only sleep at night! I set alarms on my phone that show on my watch and this works for us. As with anything, if you want something to work then work it. Keep pushing what you’ve decided to do. If it doesn’t work then change it up a bit and keep going. Move forward. I assure you 100% that a routine will work if you keep at it. 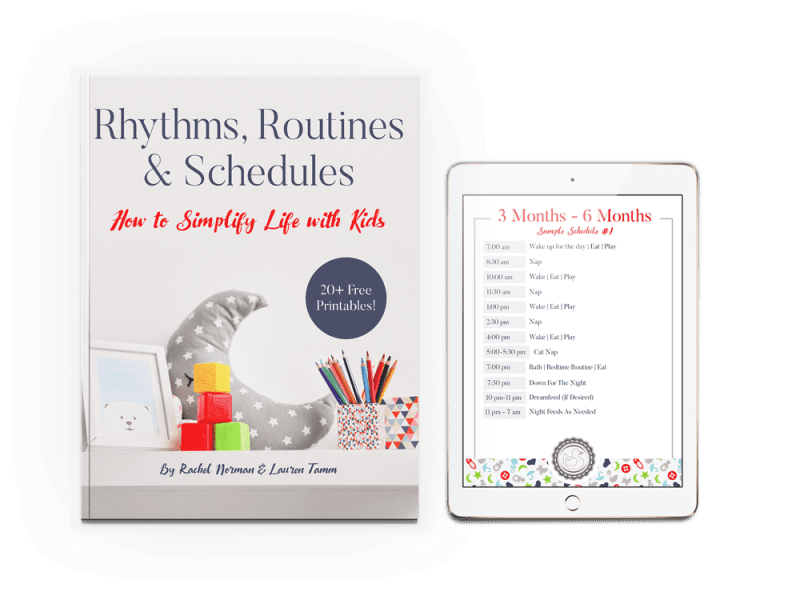 If you want routines and schedules for the 3 to 6 month phase, but also for 9 months, 12 months, 18 months, and beyond, and on I’ve got great news for you. 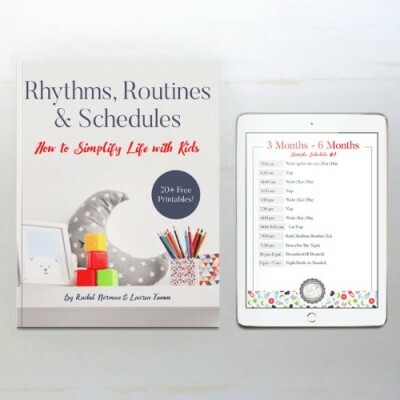 I’ve created a book chock full of routines that work. Routines that keep babies and toddlers well rested, happy, and content. Routines that account for all the things you need to do and they are mom tested. The best part? The book comes with printable routines (3 choices for each age) that you can hang up and use! So instead of having to reinvent the wheel every few months, you’ll have tried and true mom tested routines right at your fingertips. This is such a precious age. Baby is still little and tiny but is getting a bit of personality. Is awake more, smiles a lot, and even starts laughing. Enjoy this precious time, mama! If your baby has been sleeping all night wouldn’t her diaper be soaked through at 5 am? I have to change my baby’s diaper twice in the night. If they’re only feeding once or twice a night it doesn’t soak through but I’ll often put a cloth diaper over the diaper. It will be full in the morning for sure! Changing diapers wakes babies fully up so I find putting a diaper or two into a cloth diaper cover means the baby isn’t sitting in pee but isn’t getting woken up over and over for a change. With this routine, do you expect your little one to sleep two hours until the next feed? Or do they wake any time before but you keep the feeds consistent? Also my lo is 5.5 months and already been introducing solids. Should I be transitioning over to the 6-9 month routine now or wait until he hits 6 months? Alyssa, when mine does solids I often have to transition to the 6 month routine because he’s so full and will sleep longer. Also, if my little one wakes up early and is not crying or visibly hungry I’ll just wait until the normal agreed upon time. How long of nap would you recommend with this schedule? Hi Lisa, Anywhere from an hour to 2.5 hours is okay. If baby is taking naps throughout the day it’s more important that he DOES sleep, not so much how long exacty he does it. I have a 5 month old and she still wakes to nurse every 2.5 hrs at night. She goes right back to sleep and is sleeping 7:30-7:30, which is amazing. Do you have any tips to help her to make it longer before needing to nurse? Also she now will only nap for 30-45 min during the day, is she getting enough sleep? Vieve, how much does she eat through tehe day? Solids yet? If she’s a hearty nurser and sleeps well and long it’ll likely change when she finally gets a good amount of solids here in the next few weeks/months. With the 5am feeding do you wake your baby up for this or are they usually waking up around that time to eat anyway? Also, Do you wake your babies up from nap to eat during the day? I have a 3 month old who after a dream feed around 10:30-11 will still wake up a few times at night grunty but will go right back to sleep if I give him the paci. Do you recommend letting him grunt/cry it out or continue putting the paci back in until he is old enough to put it back in himself? Savannah, so to answer your questions I will wake baby up at the 5 am sometimes if he doesn’t ‘wake up. If he wakes up, feed him, if he doesn’t wake him up! During the day I DO wake them up to feed because if they sleep longer for naps during the day they’ll sleep less at night. Also, I’ll gvie the pacifier if baby will take it. Sometimes they do this for a week or two, take the pacifier a few times and then gradually stop waking for the pacifier. Maybe instead of 3 feeds at night, you give paci 2 and feed one. If that seems to work for baby that’s fine! When a baby only sleeps for half an hour naps, what do you recommend? The only way I get him to sleep longer is if he is on my chest. I understand then it should only be at most 2.5hours, but he could go longer because he has barely slept all day. Trying desperately to get him to nap by himself and for longer, and nothing is working. Ive been trying for 2months now, and he is now 4months old. Jackie, if he slept for a morning nap on your chest (for a long one) would he take a longer one in the afternoon? My concern is that if he goes all day with such short naps that he gets super exhausted. Rachel, this is all so helpful! Did you ever deal with any 4 month sleep regression issues and if so, how did you handle/fix them? Brittany, occasionally I did and I usually just FED THEM FED THEM FED THEM FED THEM. Nursed mostly, a lot and hoped more milk came! Have you taken my free sleep series listed below? Thanks for the advice Rachel. This schedule is exactly what my 3 month old son does naturally when we don’t have any other schedules that interfere with his naps. Last week, on holiday, he took naps like this during the day and then slept through the night as well. It was heaven. But now that we are back in the city and my 6 year old needs to be picked up at 4pm each day, baby wakes up early from nap #3 when I transfer him to the carseat and the rest of the day spirals out of control. With the exception of the catnap, baby fusses all evening and needs constant attention. Dinner is delayed and by the time dad gets home (7:45pm), the boys and I are all a complete mess (and so is the kitchen!). My 6yo doesn’t get to sleep until 9pm and tonight baby finally closed his eyes at 10pm! What would you do? I really need some help figuring out this evening routine. Justine, hmmm yes these evening pickups are SO HARD. So if you put baby back down for a catnap when you get home will he take it? I see that it’s dinnertime that’s causing that issue, right? Everything is delayed because you are all hands on deck with baby? Can you wear baby or put him in a swing and let him calm down during that evening time? How much longer than “scheduled” does it make sense to let a 3 month old nap? Obviously a 4 hour nap would turn things upside down, but would you let her sleep half an hour or an hour past when you plan to feed, or wake her up pretty much at that time if she’s already taken a decent nap? Hannah, I probably wouldn’t go longer than 30 minutes over. The goal is a well rested baby, so if it works then do it! If they nap too long at once it can disturb the othe rnaps resulting in an overtired baby near bedtime. However, nothing is “set in stone” so if baby can do it that’s fine. Hi Rachel, my son is 3 months old. He has big problems with gas and he usually wakes up during the day after 20minutes of his nap, but that is not what i wanted to write about. I was wondering how to help him sleep throught the night? He goes to sleep around 8pm and then wakes up after 1pm, I feed him and he usually falles back to sleep easily but then he wakes up around 4/5 in the morning and he is fussy and it is harder for me to put him back to sleep…what should i do to help him sleep longer in the night? Martyna, does he take full feeds during the night? Hi Rachel, do you adjust for increased wake times? Or do you continue to feed 3hourly? I pretty much feed 3 hourly until 6 or 7 months then sort of stretch some feeds out. 4 hour schedules didnt’ work for me well until baby was eating a ton of solids. Hope that helps. First off, your insight is VERY helpful! I’m happy to say my boy follows a pretty solid routine, but with shorter naps (45-1 hr) throughout the day. However, these naps are in my arms…what is the best way to transition to the crib/bassinet for naps durIng the day? I’m afraid if I put him in the bassinet, swaddled, he’ll think it’s bedtime and it will mess up his night – which is going so well right now. Also, if I’m planning on going to the gym, should I change the routine so that he stays asleep during the class? Or do I keep the routine as is and hope for the best? Thanks I have find you, I really need help in this area. Any suggestions for getting back on track with a routine after missing a nap time or getting down for a nap late? For example, if you need to run errands and baby won’t nap while out. Thanks! I love this post! Very good advice. This may seem silly but can you send me the link to what you use in the sink for bath time. The link took me to the tummy time blanket (which looks neat too). I have a 3 month old and I’ve yet to find something that works for bath time. Thanks! Many thanks for the advice. My 3 month old is always sleepy after feeding, so it seems counter intuitive to do a eat play sleep schedule, as I would have to wake her up to play and then when she’s awake after playing, I have to make her sleep, could explain why the routine is on a eat play sleep basis? She also always cries when we try to get her to sleep and would wake up from naps crying after 10-40 min and would be very difficult to get her to sleep again. Should I make her sleep again, let her out of her cot to play, play with her when she is in her cot or leave her to play by herself in the cot? Hi! Love this schedule, it fits perfectly into our daily routines. I have a 3 month old who has been actively refusing that last catnap. Do you recommend just leaving him in his crib for that time regardless? Or just skipping it altogether? Also, would bedtime then remain the same? Rachel this has saved my sanity! My 5 month old was getting super cranky and rubbing her eyes but would cry inconsolably when I tried to get her to sleep. I was so confused since she is my first baby. I had no idea that she wasn’t supposed to be up all day or that her being over tired meant she would fight sleep. I’ve been sticking to this routine and this first day I had to lay with her all day to keep her sleeping for two hours at a time but today she is sleeping so much easier! I want to cry im so relieved! Thank you so much!